The latest figures from the Bionext organic association show that export sales of Dutch organic products have again risen strongly in 2014. Export sales in the Dutch organic sector, which comprises 3,600 business, amounted to 928 million euros in 2014 - up 11 percent compared to 2013. Dutch Minister for Agriculture Sharon Dijksma made the announcement today at BIOFACH, the world’s largest trade fair for organic products held in the German city of Nuremberg. The Netherlands is a partner country at this year’s event, where a record number of 100 businesses are in attendance. Dijksma: "Other countries enjoy our organic carrots, tomatoes, cheese, eggs and cereals. Sales of organic products have risen by 100 million euros, and with good reason. Consumers increasingly want products where the focus is on animal welfare, nature and the environment. Sustainable, green development and our businesses can respond to that demand – because in the Netherlands, we cultivate quality!" 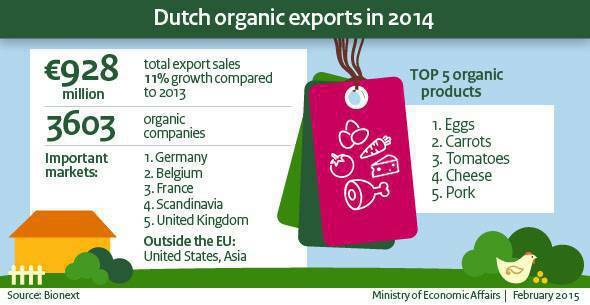 Neighbouring countries remain the most important markets for Dutch exports of organic products. The highest demand is for cereals, carrots, eggs and dairy produce. Germany is by far the most important export market, with a share of over 40 percent. Many Dutch organic businesses work closely with their customers in Germany, and often open branches there as well. After Germany, the most important export markets are Belgium, France, Scandinavia and the United Kingdom. Exports to the United States and Asia have also seen strong growth, which offers encouraging prospects for the future. The largest increase was in export sales of organic greenhouse vegetables, which rose from 43 to 50 million euros. In the period from 2008 to 2013, domestic consumer spending on organic produce in key sales channels rose from 500 million euros to almost one billion euros, making the Netherlands one of the fastest growing markets in the world. Global sales of organic products amount to over 80 billion dollars.